In short: It's when someone tells you (or implies) that your interpretation of reality isn't true. They do harmful things, and then deny ever doing those things (or minimize the details of it). They discount memories, evidence, and facts -- in favor of lies. They often accuse you of doing things that they themselves are doing. They rewrite history whenever convenient. Another good word for it is "crazy-making", because it literally makes the recipient feel crazy, questioning their own reality. Gas-lighters love to provoke others. They take inventory of the things that upset you, and then do more of those things. You will likely react calmly the first three or four times, thinking you resolved the issue. But then they do it again. And again. And again. You think: "How in the world could someone be this dense?". Gas-lighters use their tactics for many reasons -- control, power, entertainment, and sheer boredom. But the most common time you'll notice the gas-lighting is when you point out their misbehavior (or ask them to take responsibility for it). This is when they'll ramp up the abuse, twisting your words and re-writing reality. Even if you think you have a slam dunk case against them with evidence and proof, they'll hurl a completely outrageous accusation at you to destabilize you, and put you on the defense. Even though you began the conversation with the intention of holding them accountable, you'll suddenly find that you're the one defending yourself (or even apologizing to them!). Gas-lighters have extremely fragile egos and interpret any criticism as an attack on their entire identity. By calling them out on their hurtful behavior, you are deemed a threat to their carefully crafted world, and so they seek to destroy you. One of the most frustrating qualities of gas-lighters is that they are constantly the victim. Even when they abuse, criticize, judge, lie, and betray others -- they somehow come out as the victim. This is just another way that they rewrite reality. They victimize others, and then claim victimhood. And ironically, they will angrily lash out at others to "stop playing victim" (because they always want to be the biggest victim). They claim others are "smearing" them, when they are the only ones attacking anyone. You could sit there ignoring their provocations completely, and they will still run around telling everyone how much of a lunatic you are, and how obsessed you are with them. You likely treated this person with an unusual amount of patience, kindness, and compassion. None of this matters to them. They have no loyalty or integrity. You eventually start to realize that they're allowed to insult and criticize you as much as they want, but the moment you simply ask them to stop, you are an "abuser". This is perhaps the biggest and most important sign. 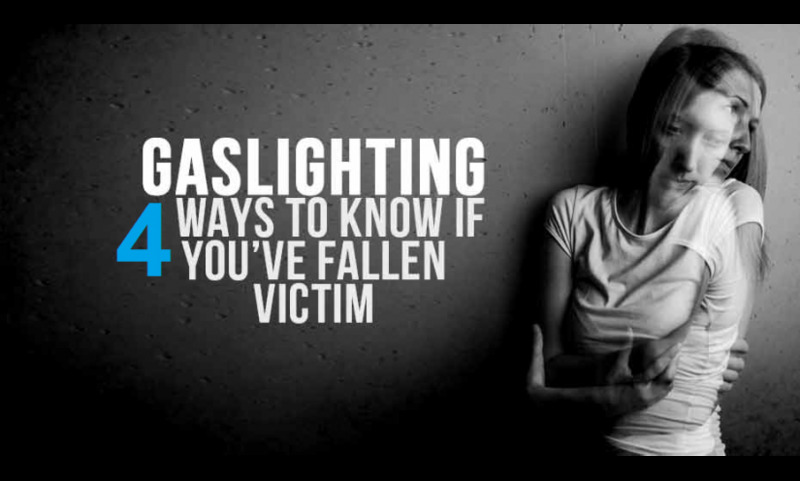 Especially in familial and romantic dynamics, gas-lighting can cause long lasting damage. When someone you love and trust uses this type of abuse, it's extremely confusing. It can cause a certain type of emotional trauma called C-PTSD, where you feel disconnected from the sensations in your own body. This is because you've stopped trusting yourself. You begin to over-analyze and ruminate on every little detail. You flip flop back and forth between "my fault" or "their fault". Even when you settle on "their fault", there remains a relentless voice inside of you that questions this reality.